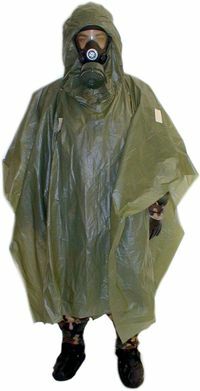 C-Cover Poncho consist of an elliptical hood section, flat sealed on to a rectangular sheet, which seal also forms an entrance for the head, even with helmet and mask being put on. The hood section has a circular and flexible operating in the front to be stretched tightly around the filter, the expiratory outlet and the goggles of the mask. The multiply, 60 ųm thick, military Bull green PE-film. The packed poncho is 110 mm wide and 60 mm thick, and its weight is just 200 gram.